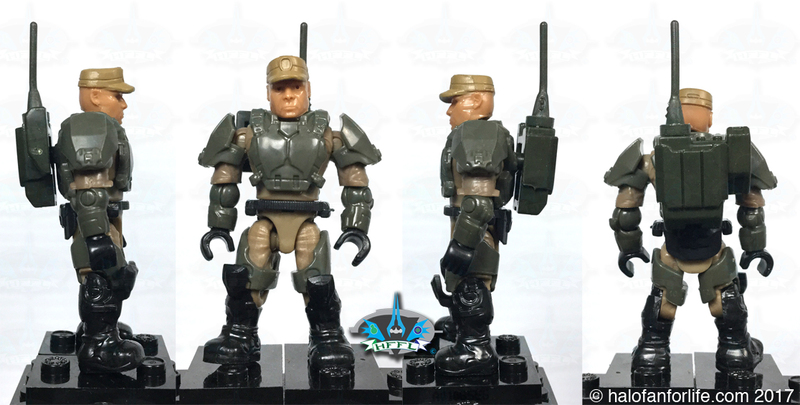 Minifigures: Marine Sergeant, Flamthrower Marine, 2X regular Marines w/full goggle and face mask. 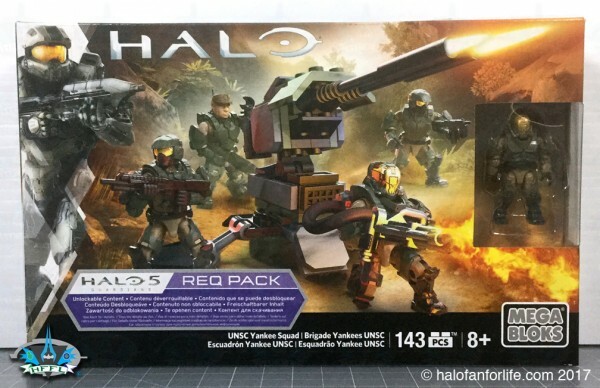 The box art shows the figures and turret in a neat action scenario. 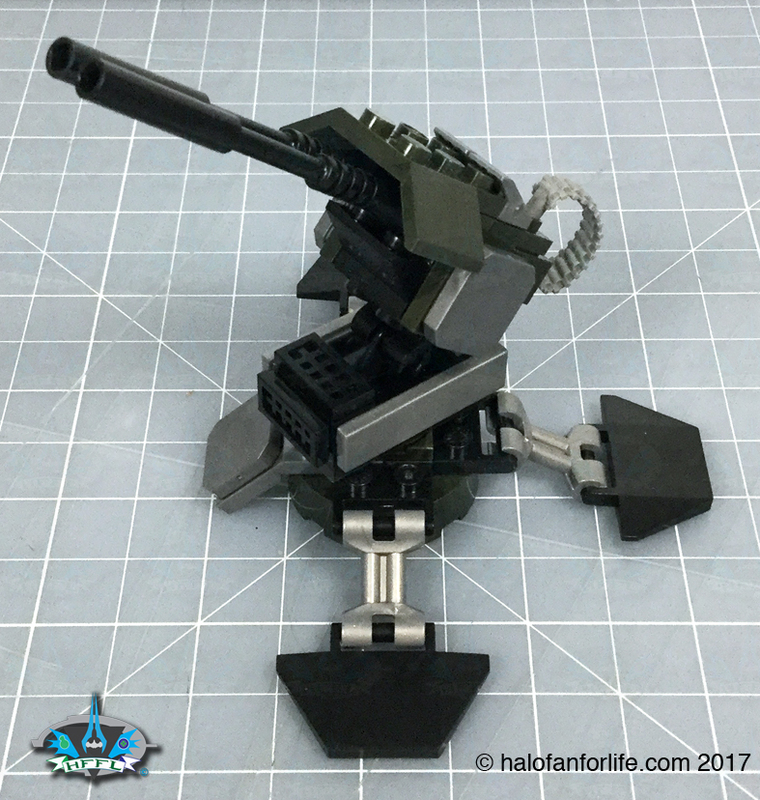 No, the turret doesn’t have blast pieces attached to the front, but that would have been cool. As you can see the set includes a REQ pack code inside for Halo 5 Guardians.The back of the box gives you the general names of the figures and shows the weapons/accessories included. This is what you get inside the box. The REQ pack card, a pamphlet of instructions, the Flame Marine pre-assembled in the plastic bubble, 2 largeer plastic bags with parts and 3 smaller bags with figures (unassembled). I had a couple of loose parts from one of the figures floating around in my box. I found the culprit. 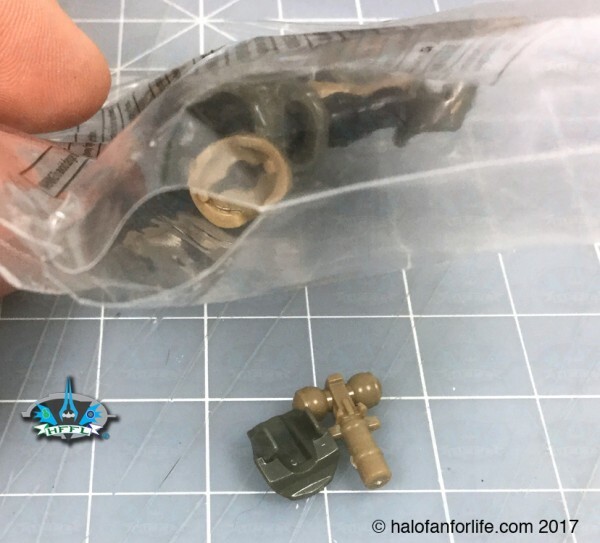 One of the figure bag seams had opened up. It was like this when I bought it. This is not the norm, so I wouldn’t worry about it, if I were you. Here are all the parts sorted out. Happy to report all figure pieces were present. Okay, lets start with the build of the turret. It’s a fast and easy build. The base of the turret has three “legs” that have tw points of articulation each. After the base comes the main bodt of the turret itself. 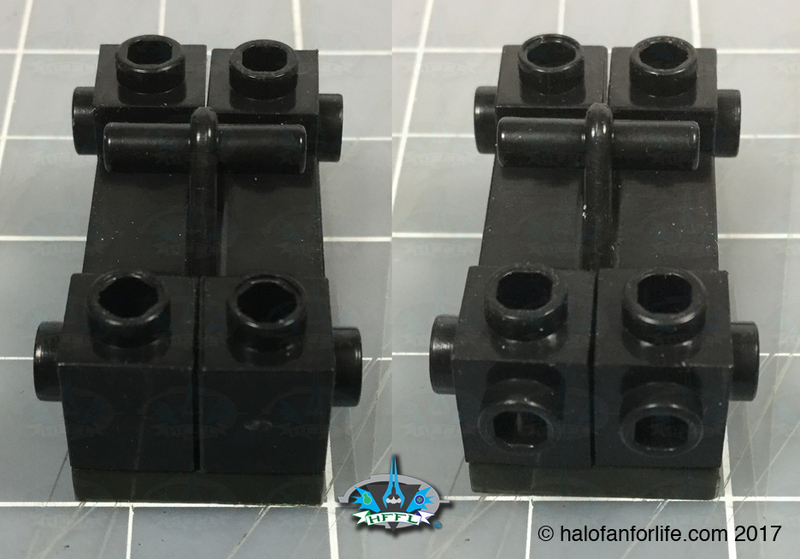 I felt the need to include the below two pics as the instructions were exactly clear as to how this section was built. So please feel free to reference this when you build yours. They show one side then theother side flipped around 180°. More details are added to the body, including a 2×2 swivel plate that allows the body to pivot on it’s axis. 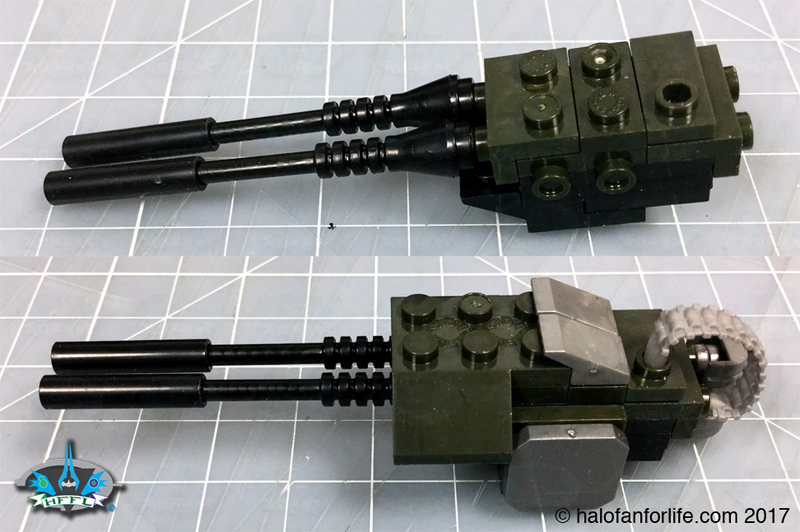 The turret gun assembly is simple and effective. It includes a “can-fed” bullet chain assembly on the back of it. Simply clip the turret to the handle of the body and it’s done. This shot shows the lack of the fourth leg, which is fine actually. I believe that’s meant to show stability. I do like that there is no restriction of movement when turning the turret. It can pivot up and down pretty far too. So, it has great range of motion. Here are the weapons included. A buildable flamethrower. This is the same as we’ve had before. Nice shiny silver! 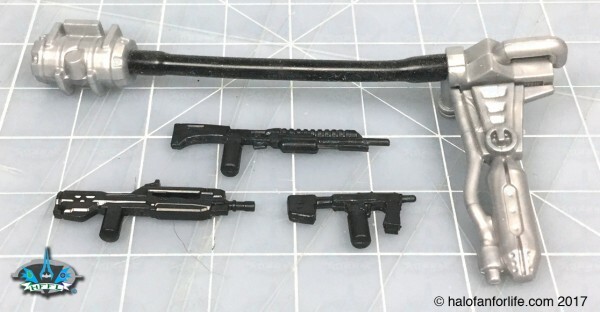 As well all black shotgun, SMG and BR. Let’s take a look at the figures in the set. 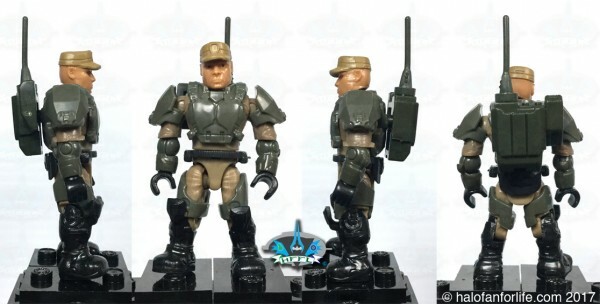 Marine: There are two of the same of this figure. I’m only showing one here. As you can see I added the backpack to the figure. 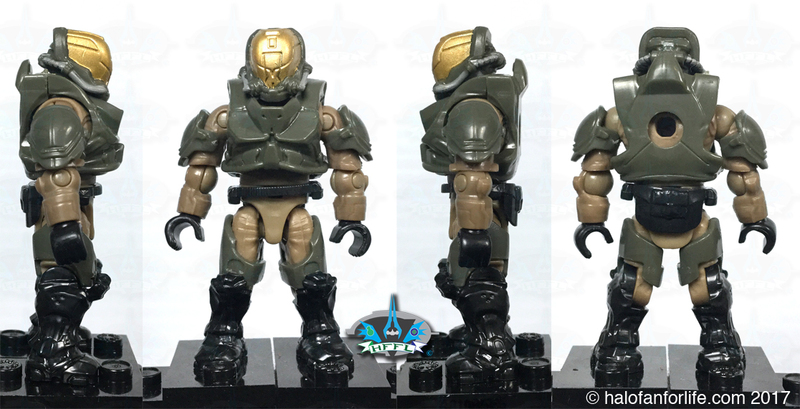 Just a small note that the backpack is slightly darker green that the green armor of the figure. Marine Sergeant: The sergeant is the exact same as the regaular marines with exception to the head. As you can see here, it has a cap, instead of a helmet. The backpack on it is a 2-piece communications backpack. You can put this on a regular marine if you wish, instead. Flame Marine: The Flmae Marine is very close to the same as the other figures. The torso armor is different though as is the helmet. The one other difference is that the forearms are tan instead of green. Great looking figure here. I left off the flamethrower here to sho the hole size of the torso armor. The flamethrower fits in quite well, I should add. And here is the completed set! Summary: This set is a quick build. Only one step may make you stumble. I addressed that earlier in the review. Other than that, it’s a very easy build and can be done in mear minutes. 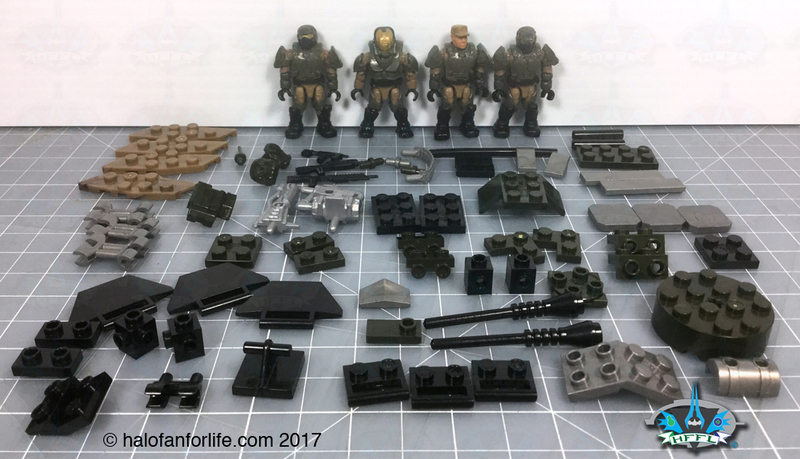 As an all army building set it’s fantastic for those who want a lot of marines quickly. Overall Rating: I give this set 10 out for 10 medals. Why did I give it a 10 out of 10? • There isn’t anything about this set that I can complain of. It;s GREAT foir arny building, which I LOVE about it! THe colors used are fantastic and fit in well with previous UNSC Marines.The turret is a simple, yet effective build and looks cool when finished. 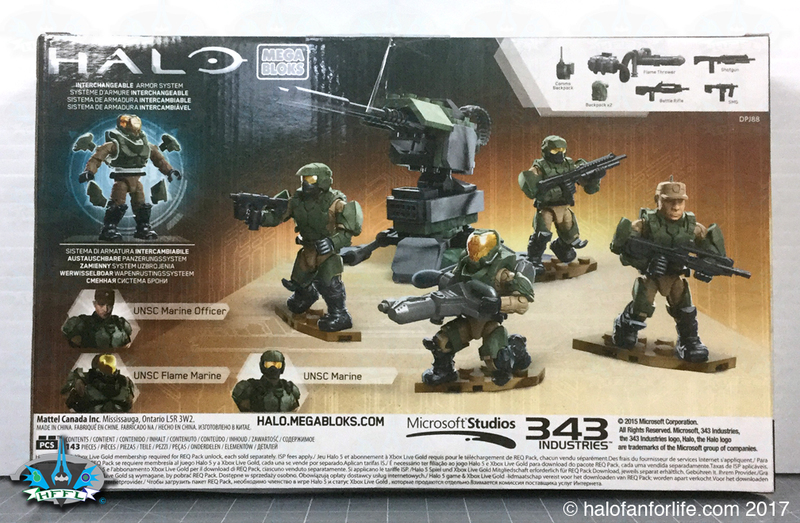 This set is not billed as a Halo Wars 2 set, but could easily be integrated into your Halo Wars 2 army if you so chose. • Each figure with one of the weapons each and stand is $3.50 each. Total of $14. 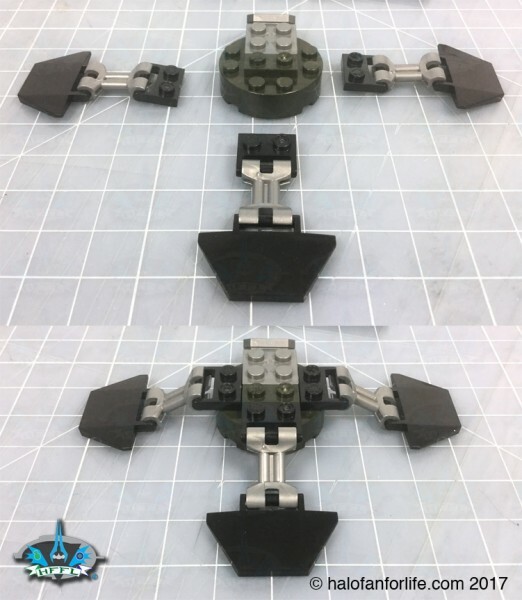 • The buildable turret consists of 55 parts. Going by the building blocks guideline of 10 cents per piece that would make the turret a $5.50 value. I wouldn’t say it’s quite that, but definitely in the $3-4 range. Given that the set only cost $16 U.S. before tax, this set is WORTH the cost. Now, to the fact that I paid more for this on eBay. I paid $20 (free shipping thank goodness). Now, looking at my evaluation above, you might say that I paid more than what it’s worth. However, I’m going to contradict that here. 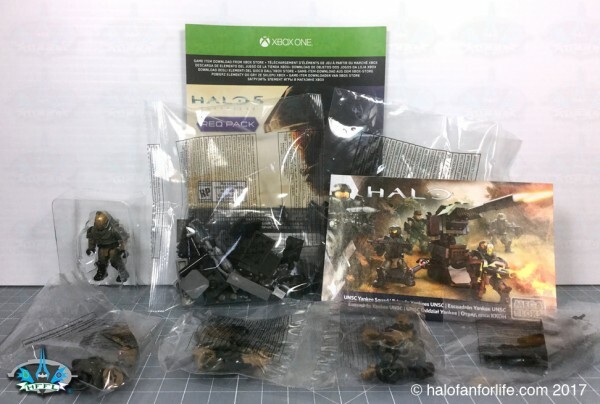 If you look at the example of Fireteam Osiris, that set had 4 figures and a buildable stand. Yes, it had nicely painted weapons and the figures were well painted as well. However, at it’s core it’s still just a set of 4 figures and a stand. This set, Yankee Squad, is very much similar in that respect. As an army builder, being able to have a whole set of nothing but marines is a big thumbs up from me. SO I found that even though I paid a little extra for this set than I normally would, I was okay with that. No buyers remorse at all. Do I recommend it? MOST DEFINITELY YES!! Being an all army nuilding set, if you’re into that, this is a MUST have. 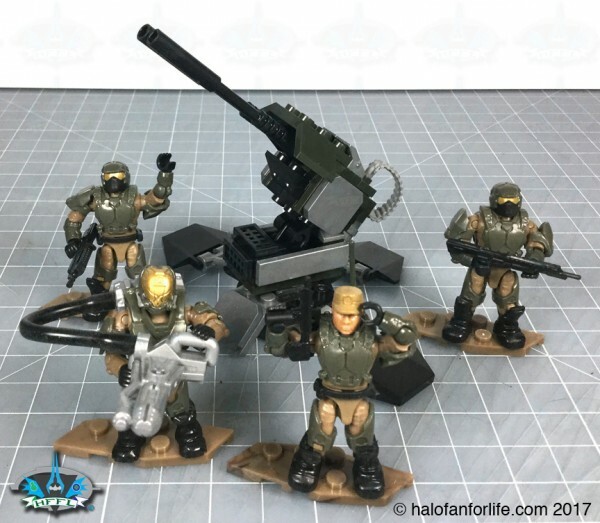 Even if you’re not into building armies, this is a great set to have a nice litle variety of Marines.